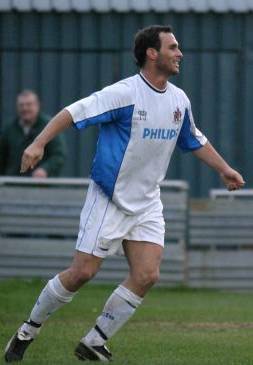 Striker who joined the Saints in February 2004 from Dagenham & Redbridge. Started his career with Dulwich Hamlet and then joined Fisher Athletic in the summer of 1998. However, his stay with them was brief as he was snapped up by Leyton Orient two months later. Played over 130 times for the O's and also had loan spells with Welling United, Margate, Dagenham & Redbridge and Lincoln City. Will be remembered for his stunning injury time goal against Bedford Town in the play-off win which saw City promoted to the Conference South.